Hi everyone, it’s Spiceaholic from Spice’s Bites! I’ve been reading Brandi’s blog for a long time now and love reading about the great dishes she comes up with. I love trying out new recipes and sharing them with my readers, so I was very excited to do a guest post here and to be able to share a great recipe I just discovered. This is a recipe I’ve seen floating around on the Weight Watchers message boards and lots of online recipe sites, but it is originally from Cooking Light. True to form, I couldn’t leave it alone and tweaked it, and have indicated my changes. Combine first 7 ingredients in small bowl, rub chicken with half of spice mixture. 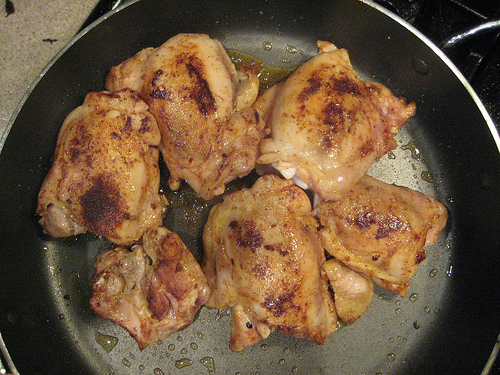 Heat oil in large nonstick skillet coated with cooking spray over med-high heat. Add chicken, cook 1 min on each side or until browned. Remove from pan. 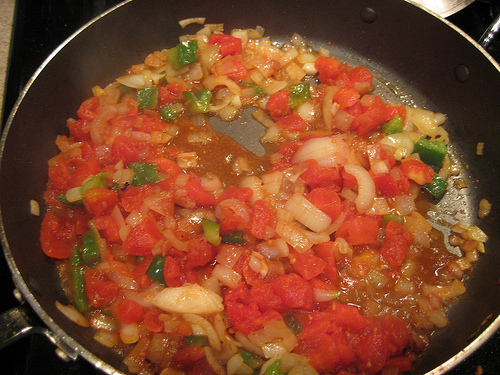 Recoat skillet with spray, add chopped onion, bell pepper, and soy sauce. Cook over med-high heat 3 minutes until vegetables are lightly browned. 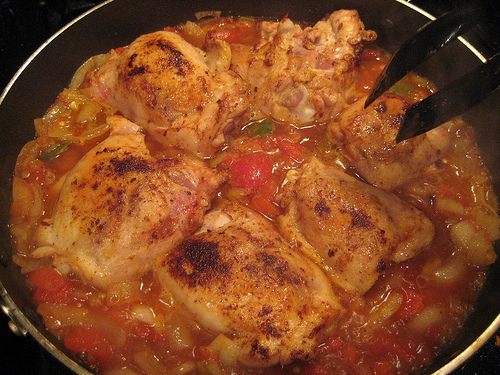 Add chicken to skillet, nestling thighs into vegetable mixture. 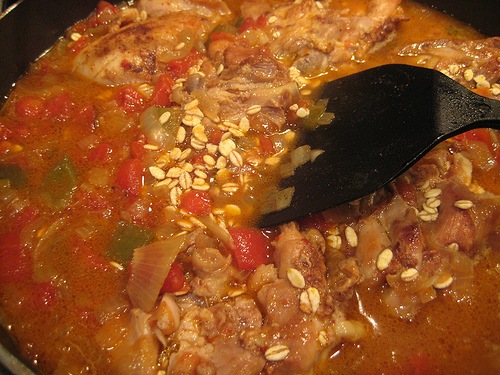 Bring to boil, cover, reduce heat, and simmer 55 minutes or until chicken is done. 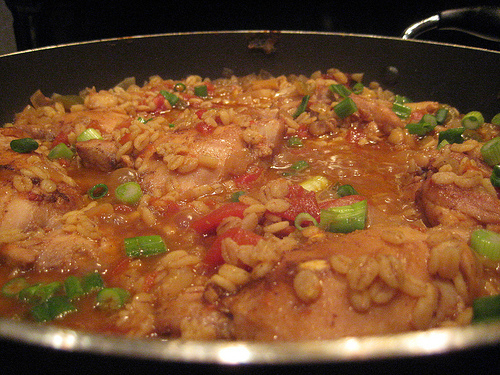 **I let the chicken cook for 30 minutes, then added the barley and cooked everything together for 15 minutes. Let stand 15 minutes. 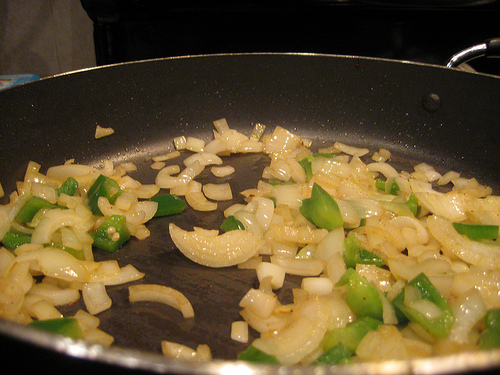 Sprinkle with green onions before serving. This recipe was so good! I don’t know why I waited so long to give it a try. I’ve never cooked with barley before, but it went really well with the chicken and the gravy and was a great change to my usual rice or couscous. Hope you guys enjoy it as much as I did. Thanks Brandi for letting me share with your readers! Oh yum! I love barley and will be adding this to my repetoire! wow! that looks delicious and super flavorful! adding barley is such a good idea! This looks delicious! I love anything with barley. wow – this looks like such a hearty and delicious meal, I just bookmarked it, thank you! !